Keely's scribe, Jacquie Rodger's, pens another wonderful short story! 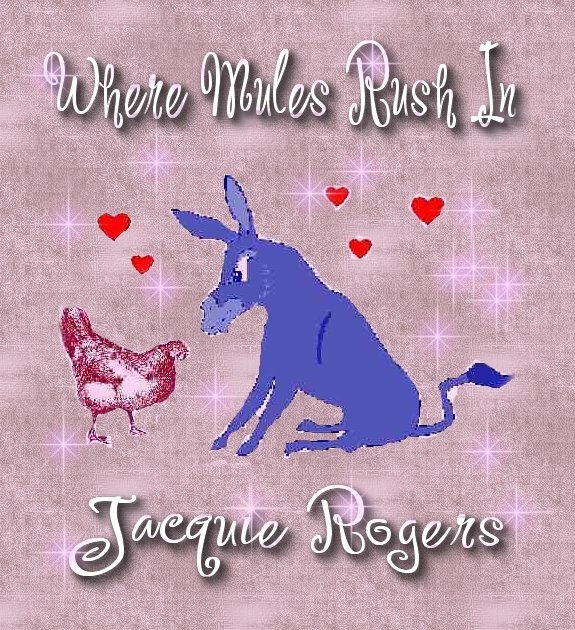 "The title may be When Mules Rush In, but readers should rush in to read this hilariously funny story, expertly penned by Jacquie Rogers. 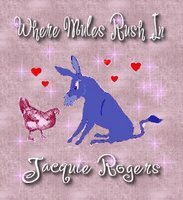 Ms Rogers spins a yarn of love and desire between a gambler in a Stetson and a debutante carrying a hoe, while a determined mule named Merlin stirs up magic with his tail, along with the help of a bossy chicken named DeborahAnne. "When Mules Rush In" is the story of salvation that unites lovers, both mortal and immortal, while being a ripping comedy sure to make the reader laugh out loud. Luke Tyson is a gambler on a mission. He wants to buy a ranch and settle down before his luck runs out at the card table. He thinks he’s found a way when he’s offered a tidy sum to find missing heiress, Eleanor Winthrop-Douglas and return her to her fiancée. Trouble is, his mule, Merlin, has other plans for the charming cowboy. Merlin is set on finding Luke love and happiness with the right woman, a home, and a family. When Willow Jones sees the handsome cowboy ride up on a mule, she stops working in her herb garden, mesmerized by his good looks, but leery of strangers. He seems familiar, but she can’t place him. How could she have forgotten anyone that handsome? The Blue Moon. Every night since the full moon, she’d wished that a man like him would rescue her from her loneliness. But she wouldn’t have a man who wanted to woo Eleanor so he could claim the Winthrop-Douglas inheritance. Gripping her hoe, she denies her true identity and orders the stranger away. However, both Luke and Willow fail to take into consideration the power of a Blue Moon or the magic of an immortal mule and chicken determined to forge a relationship between the stubborn couple. Merlin the mule intervenes with his love spells, while the feisty chicken, DeborahAnne rules the barnyard with her own magic. With the lovable animals’ help, Luke and Willow manage to fight off five armed men and form a bond of love, planning their own magical relationship. Ms. Rogers wraps up this comedy with an exciting and unexpected ending. She left this reader with tears in her eyes from laughing so hard and begging for more stories featuring these amazing characters. I can’t wait to read future writings by this super talented author, and plan to re-read this story whenever I need a feel-good laugh. 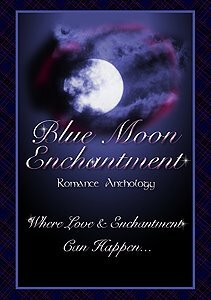 You will enjoy many other wonderful romantic stories that can only happen Once in a Blue Moon in both Blue Moon Magic and Blue Moon Enchantment Anthologies by Highland Press. " Narnia. Middle Earth. Atlantis. Camelot. When you hear the names of these fantasy worlds, your mind swirls with images of the inhabitants, environments and most of all, how they all fit perfectly within the story. That is successful world building. When done well, it can place your fantasy novel on the keeper shelves of readers everywhere. Fantasy is described by Merriam-Webster’s dictionary as: "imaginative fiction featuring especially strange settings and grotesque characters.” I have to whole-heartedly disagree. To me, fantasy is more aptly described as a place where anything is possible. Unlike other genres, like say science fiction, fantasy does not have set boundaries or rules. You don’t have to abide by the scientific laws and technical or planetary details of the age. You can pretty much write anything your mind conjures. Each of these fantasy examples took us to wonderfully exciting new worlds and immersed us in their respective stories. All three are different, but exceptional examples of how to successfully build a world, specific and unique to the story line/characters you're working with. Nothing to it, right? Well, it's certainly do-able. The first thing you want to consider is what kind of fantasy you are writing? There are four common sub genres found in fantasy romance novels, Epic being the broadest of them all. With an Epic fantasy, the world you’ve created will be at stake in a good vs. evil type situation. Both the Heroic and Sword & Sorcery sub-genres evolve from this grand, Epic beginning. In the Heroic tale, the hero sets out to save the world, thus the story becomes more about him/her than the actual act of the world being saved. (Think Frodo in the Lord of the Rings) Sword & Sorcery stories are usually set in some ancient setting, and concentrate on wizardry, swordplay, dragons, etc. (Think King Arthur, Xena, Harry Potter.) Last, the Historical fantasy will take an actual event, place or person, but add magical or supernatural elements. (Think Ladyhawke, Beauty and the Beast) Though some may argue there are more fantasy categories than I listed here, in romance we have a paranormal genre, which covers things such as werewolves, ghosts, witches, vampires and so on. Okay, so you've chosen the specific sub-genre for your fantasy. Now it's time to create your world. The thing to remember with world building is to keep it simple. This is where it can get sticky. You don’t want to go overboard and make every element of your novel strange and overly detailed. This will only jar the reader, making it harder for them to suspend disbelief and continue reading. Instead, the goal should be to ensure the world you’ve created feels believable and comfortable. One way to do this is to keep certain elements within your story familiar. For example, if you have a centaur warrior as your hero, have him enjoy a cold beer while watching the two moons raise overhead. The beer keeps him real. It humanizes him in the readers mind, making him relatable. Harry Potter may be learning how to fly a broom or fight a fire-breathing dragon, but he’s doing these magical, crazy things in a school. A normal, familiar setting we are all at ease with. Ideally, you want even your most bizarre creatures to have some human characteristics otherwise readers won't be interested in them. Perhaps there are demons from the underworld in your story. Try having them addicted to things like chocolate, tobacco or even air conditioning. Of course, the pitfall with this technique is making the world you create too similar to our own. The idea is to show the reader objects, ideas, morals, notions they can recognize and relate to, in the milieu of the new and exciting. Balance is key. Last point…names. Use ones that fit the story time, place, feel and characters. Do not just pick some exotic, hard to pronounce name because it's different. I recommend saying the name aloud. If it trips you up, change it. Also, pay careful attention to the masculine and feminine. You don't want the readers guessing a being's gender any more than you want them stumbling over their name. And unless you are writing a time-travel fantasy, be careful not to name one character Xielnain, and another Steve. Above all remember, however you decide to create and organize your fantasy world, make it as familiar and true to life as you can. The more ordinary it is, especially in its eccentricities, the more extraordinary and memorable it will be to the reader. Has it really been so long since I posted here? I have four blogs and keep losing track! As for writing, I have two more scenes to polish on historical and then I'm putting her to bed, so to speak. THE MARQUIS & THE MISTRESS, are ready to see the world! Not to mention the paranormal I've plotted out is screaming at me to pen...I've really got to get a hand held recorder so I can "write" while I drive. LOL! Expanding on this newfound knowledge, I intend to send out press releases to Ft. Collins, CO. where I went to college, and St. James, MN. where my grandfather's kin have all been since coming over from Norway before WWII. If this theory is true, I should hear back from both of them before Madison. Will keep you posted!! After there's Magic...there's Enchantment!! 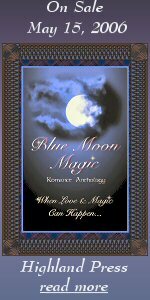 The second anthology in this set of "Once In A Blue Moon" themed books is due out in June 2006. It's once again filled with 15 wonderful tales...from futuristic, historical, contemporary and paranormal--there's something in it for everyone!! The cover is so beautiful! I cannot wait to hold this puppy in my grubby little hands! Not to mention read all the stories from the other, wonderful contributing authors - Leanne Burroughs, Deborah Ann Macgillivray, Aysel Arwen & Dawn Thompson to name a few.